Raising a family can be tough. First of all, it’s expensive. The USDA estimates that raising a child born in 2015 would cost a family $233,000 over 18 years. It’s common nowadays for both parents to work outside of the home, meaning they need to pay for full-time child care, which can be very costly. Parents also want to give their children the best chance to succeed so school quality is on many parents’ minds when deciding where to live. Buying a home? Try SmartAsset’s mortgage calculator to find out what your mortgage payment will be. In order to find the best cities to raise a family, we looked at eight factors. Specifically, we looked at data on high school graduation rates, the percentage of students proficient in math and reading, the percentage of the population in each city who are under the age of 20, the percentage of people in each city who are living below the poverty level, the unemployment rate, the crime rate per 100,000 residents, the annual cost of child care for an infant and housing costs as a percentage of income. For more on where we got our data and how we complied it, read the data and methodology below. 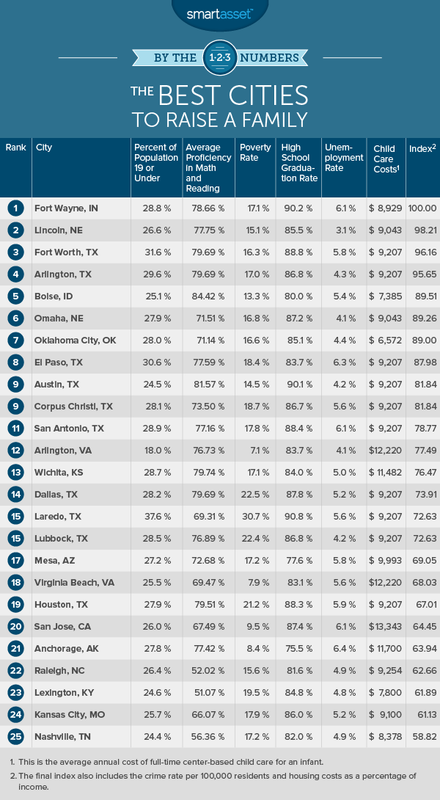 Lone Star State – Texas cities make up half of the top 10. Many cities in Texas combine low costs of living with good schools, the perfect combination for raising a family. No coastal cities – There are no cities from either the West Coast or the East Coast in the top 10. The highest-ranked coastal city is Virginia Beach at number 18. 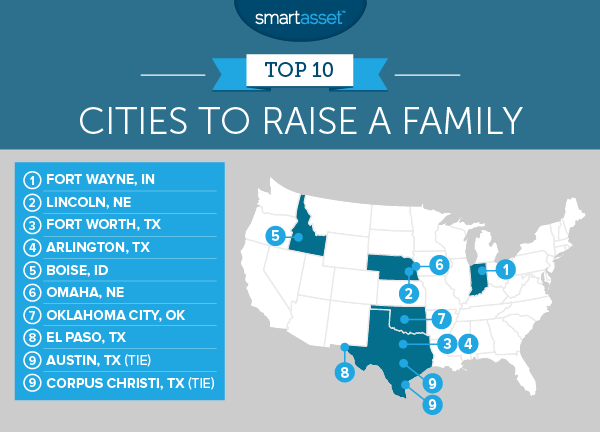 Fort Wayne claims first place in our study of the best cities to raise a family. One important factor in Fort Wayne’s favor is its high school graduation rate. Just over 90% of high school students graduate, the third-highest rate in the study. In past studies, we have found that Fort Wayne is one of the best places for teachers, as well. 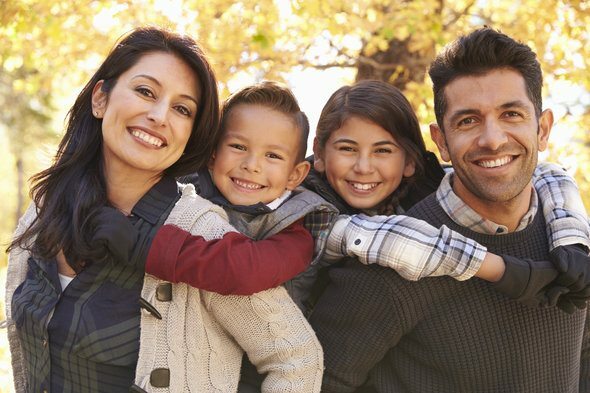 Combine that strong education reputation with low costs of living, and Fort Wayne is a great option for raising a family. The capital of Nebraska ranks well in our study because of high scores in economic metrics and quality of life indicators. Lincoln has the lowest unemployment rate in our study (3.1%) as well as the third-lowest percent of income which goes toward housing (around 21% on average). The schools here are pretty good, as well. Lincoln ranks 13th for both average proficiency in math and reading and the graduation rate. Looking to refinance? Check out our refinance calculator. Fort Worth is the second-largest city in our top 10 with a population of 796,614, according to U.S. Census Bureau numbers. Fort Worth beats out the stiff competition from other Texas cities because of its high-quality schools and relatively young population. Thirty-one percent of the folks in Fort Worth are below the age of 20 and almost 89% of high school students graduate. Fort Worth ranks fifth in both of those metrics. Arlington has quite a bit going for it when it comes to raising family. Arlington ranks in the top 10 for the following three metrics: unemployment rate (4.3%), rate of proficiency in math and reading (79.7%) and percentage of population who is under age 20 (29.6%). Combine those great scores with the fact that Arlington ranks no worse than 30th in any metric, and you see why the city is a great place to raise a family. Boise is a solid option, especially if crime is a big concern for you. Boise has the eighth-lowest crime rate in our study, with 2,580 crimes per 100,000 residents. It also ranks in the top 10 in three other metrics including average proficiency in math and reading, housing costs as a percentage of income and the cost of full-time child care. In fact, Idaho families get a one of the better deals in the country when it comes to child care costs. Compared to other states like Colorado, child care costs in Idaho are half as high. Omaha has an unemployment rate of only 4.1%, the third-lowest in our study. Omaha also has the 13th-lowest percent of income going to housing at 22.8% on average, so there will be plenty of money left over to enjoy family activities together. The schools here are quite good, too. An impressive 87% of high school students graduate. If you are raising a family and looking to keep the costs down, Oklahoma City may be a good place to settle down. The average cost of full-time center-based infant care is about $6,500 per year and the percent of income which goes to housing is just under 22%, on average. One possible drawback is that crime here isn’t as low as many other cities in our top 10. There are 4,700 crimes per 100,000 residents according to FBI data. It’s worth keeping in mind that Oklahoma City is also an excellent place for first-time homebuyers. El Paso ranks seventh and is the start of a rush of Texas cities to finish off our top 10. Over 30% of the population in El Paso is under the age of 20. That’s the second-highest rate in the top 10, so kids and teens should have plenty of opportunities to make friends. You can also feel secure in El Paso. It has the lowest crime rate in the top 10 and fifth-lowest in the entire study. Austin has many advantages to offer a potential family, including a poverty rate of only 14.5% and an unemployment rate of only 4.2%. The largest city in our top 10, Austin also has some good schools. The average proficiency rate in math and reading in Austin schools is 81.5%. One thing to keep in mind is that the population skews slightly older. Only 24.5% of its population is age 19 and under. Moving to Austin? Here are 19 things you need to know. Corpus Christi rounds out our top 10 best cities to raise a family. Corpus Christi is one of the most affordable cities for families. Housing will only gobble up 22% of your income, on average, and the cost of keeping your infant in full-time care for a year will run about $9,200 per year, on average. However Corpus Christi’s poverty rate is relatively high, with 18% of residents having incomes putting them below the poverty level. Housing costs as a percentage of income. This is the median housing cost in each area as a percentage of the median household income. Data comes from the U.S. Census Bureau’s 2015 5-year American Community Survey. Child care costs. This is the average annual cost of full-time center-based child care for an infant. Data is measured at the state level and comes from Child Care Aware. Percent of population age 19 and under. Data comes from the U.S. Census Bureau’s 5-Year 2015 American Community Survey. Average proficiency in math and reading. This is the average percent of students across schools who are proficient in math combined with the average percent who are proficient in reading. Data comes from the U.S. Department of Education EDFacts for the 2013-2014 School Year. High school graduation rate. This is the average percentage of students across schools who graduate. Data comes from the U.S. Department of Education EDFacts for the 2013-2014 School Year. Poverty rate. This is the percent of the population whose incomes place them below the poverty line. Data comes from the U.S. Census Bureau’s 2015 5-year American Community Survey. Unemployment rate. Data comes from the U.S. Census Bureau’s 2015 5-year American Community Survey. Crime rate per 100,000 residents. This is the crime rate per 100,000 residents, it combines violent and property crime rates. Data comes from FBI’s 2015 Uniform Crime Reporting Program and from local police departments and city websites. We ranked each city across all eight metrics. We then averaged those rankings giving equal weight to each metric. We gave each city a score based on its average ranking. The highest-scoring city received a 100 and the lowest-scoring city received a 0.